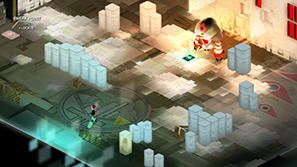 Transistor was first on my radar at it's reveal at a Playstation event, mainly due to its art style. It wasn't till I played Supergiant Games' previous game, Bastion, that I began looking forward to it immensely. Bastion combined incredible music, a great art style and an immersive narrator, reacting to your actions, with somewhat standard fighting gameplay that created a lasting impression. 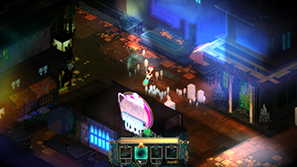 Thankfully, Transistor lived up to my expectations in nearly every way. 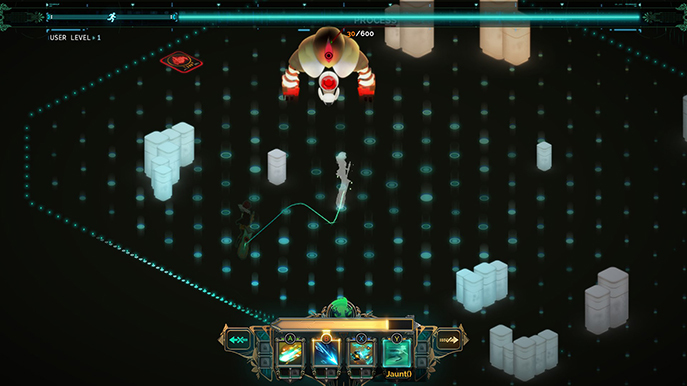 You play as Red, a popular singer who's just come under attack during a performance with someone taking the fatal blow for her, now imprisoned in the Transistor, a large sword. His conscious still alive, he acts as the narrator, while Red has had her voice stolen. The attack marks the beginning of the Process invasion, creatures that are tearing the city apart. She departs on a journey to save the city and act revenge upon those that attacked her. The art style is incredible throughout. It may be the best looking game I've played. The city is beautiful with a variety in locations. 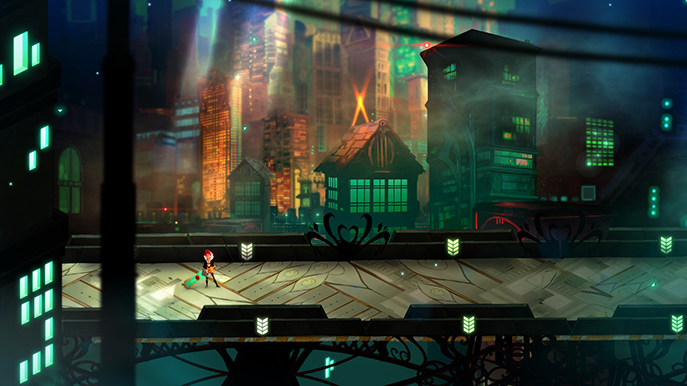 There are neon colours in the signs of buildings, great backdrops of the city and the animations are really well done. There are art pieces included after some scenarios that are breathtaking. I'm trying to avoid hyperbole, but I enjoyed the art so much I think it distracted me from understanding the story early on. The fighting mechanics have advanced greatly since Bastion. The transistor can absorb the souls/conscious of the dying and these manifest in new moves. You can assign up to four of them at once, with each slot having two upgrade spaces that you can use other Functions() in. For example, you can set a standard attack (Crash()) and upgrade it with Breach(), making the range longer. Or you could assign Breach() to a different slot and use that as an attack. There are a huge amount of combination possibilities among the twelve different Functions() available. To combat the larger number of enemies that attack you at once you can (and should) use a Turn(). This is comparable to Fallout's VATS system. You pause time and can plan out your movement and attacks. You have a limited bar for your actions and you queue movement and attacks. Information on the screen tells you your damage and whether your effects work. Press RT and it plays out in front of you. In can be very rewarding to see your plan work, wiping out your intended attackers. However, there is a cool down after each Turn() that lasts a few seconds where you cannot attack and are vulnerable to enemies. You need to plan very carefully to ensure you don't lose health after each Turn(). This can be very tricky while you're still getting used to the system and you'll find your health bar getting reduced to zero many times. Instead of dying immediately you lose access to a Function() and you'll eventually die if you only have one left and lose all your health. Functions() can be reinstalled after visiting the required number of access points, which act as save points and a Function() management screen. You can always install a different Function() while you wait for your deactivated one to become available again. There are many fighting scenarios throughout the game but it never gets repetitive. You frequently level up, unlocking new Functions(), and testing out the various combinations is fun and rewarding, especially when you find one that gives you the edge in any fight. There are also limitations (similar to Bastion) where you can make the game harder, such as double enemy damage and shields for enemies, and these give you an XP percentage boost. I had some of these on for a while but found I was just scraping by in fights and levelling up quickly enough anyway, so removed all but one. You can also install Functions() in up to four passive slots. I used one throughout that dropped Packets in fights, explosives that go off when hit. These were very useful in quickly eliminating some weaker enemies during Turns(). 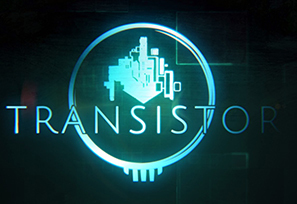 Transistor's story is memorable though it took me a little while to understand what was happening. The narration of the Transistor adds a surprisingly humanistic touch (for a whopping great sword) where he's almost mournful, coming to terms with his recent (human) death, the events destroying the city and desperately trying to figure out a solution. There is a great attention to detail to make the city a believable place (or at least, the city before the events of the game transpired). 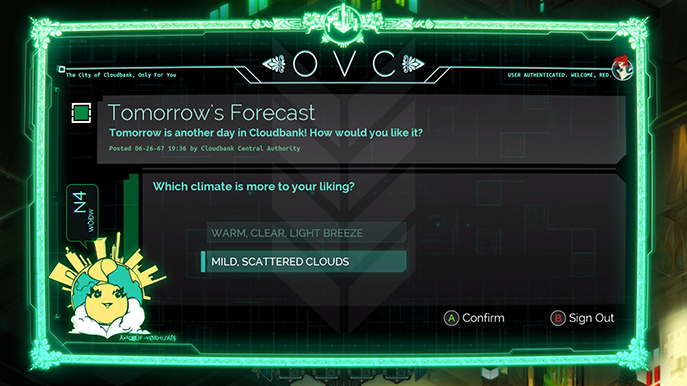 There are terminals with news articles about a range of things, including voting on what the weather should be the next day and personal food orders, and Red uses these, now slightly dis-functioning machines to communicate with the Transistor via the comment section. It is touching to see the halting words of her text and she corrects some of the things she wants to say and hearing the sword reply in an increasingly desperate manner. Like Bastion, music plays an important part in the game. Red is a singer and occasionally vocalised tracks play in the background as you fight, though this didn't happen nearly as much I would have liked. By pressing LB a spotlight appears on her and she hums along to the music. This has little effect on gameplay but is a really nice touch. The soundtrack is sublime throughout. It is important to play the game before listening to the soundtrack independently as the story and the music are tied together. There was very little I disliked about Transistor. My only real complaint was that just as I got a hold of the battle mechanics; powerful enough to not always have to use Turn() to fight, using big combos and heavily reduce the number of times I died, the game ended. It took me about five and a half hours to complete. The length itself isn't a problem but I wish I had more time to exercise my battle skills in the first run through of the game. There is a new game plus mode in which you keep all of your upgrades and the enemies are levelled accordingly but I just wished there was a little more that I could have battled before reaching the conclusion. I also wanted more areas taking advantage of the spectacular music. 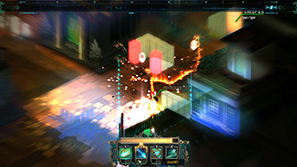 Transistor is a triumph. The incredible graphics and music are matched by surprisingly deep and complex gameplay mechanics with an interesting and touching narrative. I whole heartedly recommend it and can't wait to jump back in.